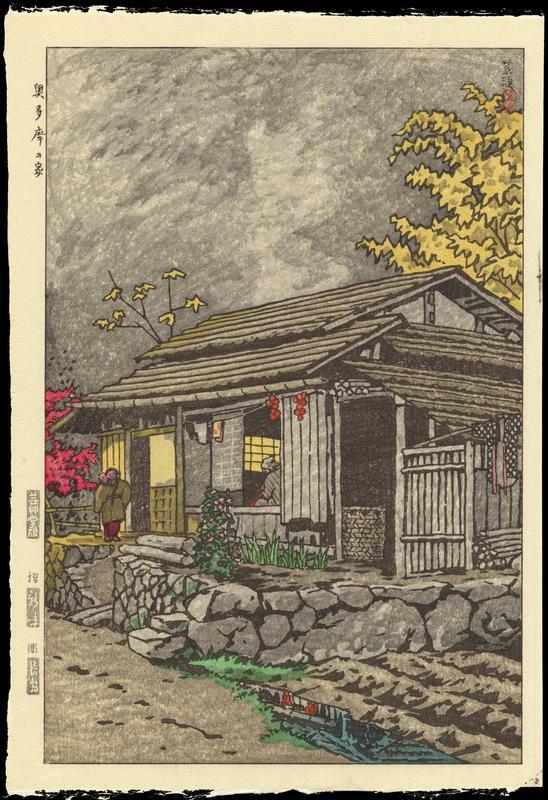 Kasamatsu, Shiro (1898-1991) "House At Okutama" - Woodblock - Chinese and Japanese woodblock prints for sale, silkscreen, scrolls, watercolor, lithographs. Artwork Details for Kasamatsu, Shiro (1898-1991) "House At Okutama"
Notes: This is a mid-edition by the original Unsodo printer of the first edition (Shinmi), not by the recent Unsodo printer. In the left margin are title, Unsodo publisher's seal, printer's seal, carver's seal, and Unsodo 'Gei' watermark. Kasamatsu signature and red seal at upper right of image.